In a large bowl, mash avocado and combine with salsa and sour cream. Add black beans, pineapple, jalapeño, onion, tomato, cilantro, garlic, lime juice, taco seasoning, salt and cumin; stir until well combined. Cover bowl with plastic wrap and let sit in fridge at least 1 hour to develop flavor. Serve with Food Should Taste Good™ multigrain tortilla chips. Hey! Who put black beans and pineapple in my guacamole? Oh, I did. And I’m so glad I did. You see, Black Bean-Pineapple Guacamole might sound crazy weird, and that’s true – but it’s also crazy delicious. It’s like the guacamole gods got together and tried to come up with very best guacamole they could possibly ever make, and bing-bang-boom, this guacamole recipe was born. Or, I just really like pineapple in my Mexican food (I’m strange, I know it) and black beans and guacamole, too, so I just made them all BFFs in one bowl and called it a day. Either/or. First, gather your ingredients. The chopping and mixing of everything is really the hardest and most time-consuming part of the whole recipe, but if you have a margarita or extra guacamole to sip/munch on whilst gettin’ your prep on, I say the whole process is a smooth sail. Mix together the mashed avocado, salsa and sour cream in a large bowl. You can use green or red salsa (though I prefer green) and sour cream or Greek yogurt (I love both). Up to you! Add the black beans, the crushed pineapple, some onion, tomato and cilantro and some seasonings, including Old El Paso taco seasoning. It really just kicks everything going on in that bowl up a notch, methinks. Combine everything thoroughly, then let it all sit in the fridge for an hour or so to develop the flavor. Give it a taste and add more salt or lime juice if necessary. 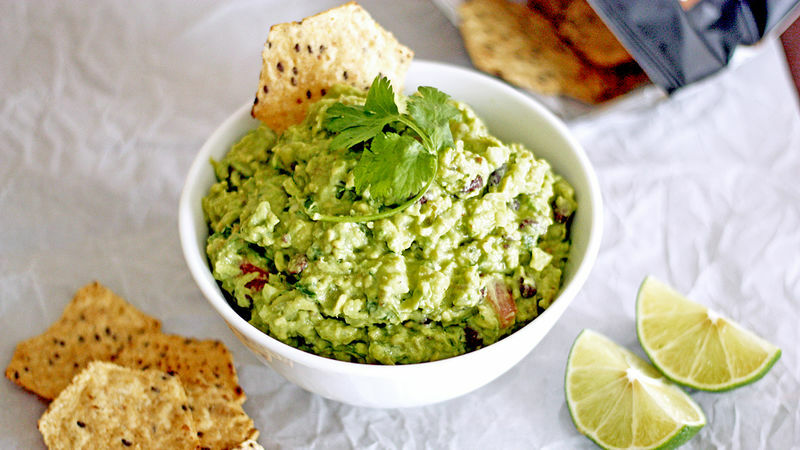 Serve your glorious guacamole creation with Food Should Taste Good multigrain tortilla chips if you really want to rock the socks off your guests (or, you know, yourself). Mmm, guacamole, I love you. Will you marry me? Stephanie (aka Girl Versus Dough) and her guacamole lived happily ever after. Check out Stephanie’s Tablespoon member profile and keep checking back for her own personal recipes on Tablespoon!